LAHORE: (Friday, April 28, 2017): Centre for International Relations Italy’s Chairman Prof Dr Andrea Margelletti has said National Action Plan is a not a national but an international plan to combat terrorism. He said that that Pakistani government was doing more to counter terrorism and there was no Islamic terrorism. 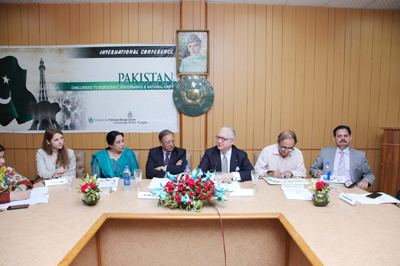 He was addressing a seminar on "European Perspective on the Issue of Terrorism in Pakistan and Afghanistan" organized by Pakistan Study Centre here on Friday. Eminent political scientist Prof Dr Hasan Askari Rizvi, former ambassador Javid Husain, AIG Punjab Police Dr. Ejaz Hussain, Director Pakistan Study Centre Prof Dr Massarrat Abid and Dr Gabriele Iacovino and Dr. Francesca Manenti from Centre for International Relations, faculty members and students were present on the occasion. Addressing the seminar, Prof. Dr. Andrea Margelletti said that Islam is a religion of peace but there were organizations and groups who were committing terrorism under the name of Islam. He said that Pakistan was not known in Europe before 9/11 but things have changed after the incident. While throwing light on Italy's alliance with NATO and especially with USA, he said that 9/11 was not only an attack on the USA but on western civilization also. He said that the perception about terrorism in Afghanistan and Pakistan has changed due to two reasons that Taliban and jihadists were regional problem and ISIS had changed the international scenario. Concluding the speech, he said that if one did not identify his enemy, one would not be able to combat. Dr. Ejaz Hussain shared his views saying that there was difference between scientific laws and tendencies or regularities when it comes to terrorism. He said that terrorism was a global issue and a cyclic process. He said that the reasons behind the cycles of terrorism were hide and seek between agencies and militants, inability to maintain a continued level of counter terrorism efforts and avoiding escalation all the time. Ambassador Javid Husain was of the view that Pakistani government condemned terrorism. He said that US policy in combating terrorism in Afghanistan has four lapses. “Firstly US had completely shifted its resources and attention from Afghanistan to Gulf which provided that space for Taliban to gain power. Secondly in deciding composition of new government in Kabul, the US totally neglected Taliban. Thirdly, for more than ten years, US searched for the solution for the issue through military means. Fourthly, while establishing government in Kabul, US enthusiastically tried to infuse western political values in Afghanistan. India and Afghanistan governments must be forbidden by international community to stop supporting terrorism in Pakistan”, he said. 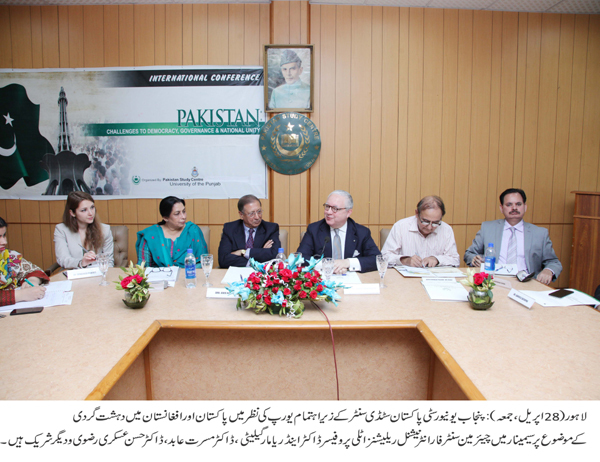 Prof. Dr. Hasan Askari Rizvi pointed out the historical nature of relations between the two countries. He said that terrorism must be addressed through four different angles. “One is military and intelligence, second one is non-military mechanism, third is societal and religious leaders and fourth is media houses,” he said. In her welcome note, Prof. Dr. Massarrat Abid said that Italy and Pakistan shared a common vision and goal on many crucial issues including terrorism and security. She said that no country could prosper without cooperation in political, economic, cultural, security and defence issues, with international community. She said Italy has a growing and vibrant Pakistani community, the second largest in Europe after UK. Peace, reconciliation and stability could be achieved by cooperation between the two countries.